I remember the first time I ever watched Jaws. I was much too young for it, and for weeks afterwards I couldn’t even handle the thought of getting in a bathtub without fear of a giant shark eating me whole. Since the time Jaws premiered in theaters, the media has further escalated the public’s fear of these ocean predators. Shark encounters are spread across front pages, headlines covered with words like “Terror” “Monster” and “Eating Machines”. With this kind of exposure to sharks, it’s no surprise that the average person admits to a fear of these so-called mindless monsters of the deep. It was my own childhood fear that encouraged me to dig deeper and face the truth of sharks. I poured through books upon books during an age when the internet was still a seed of an idea. I read everything I could about these monsters until my fear changed to something else; fascination. Growing up in the middle of the United States, I had never actually encountered a shark, and yet I was mesmerized by them. 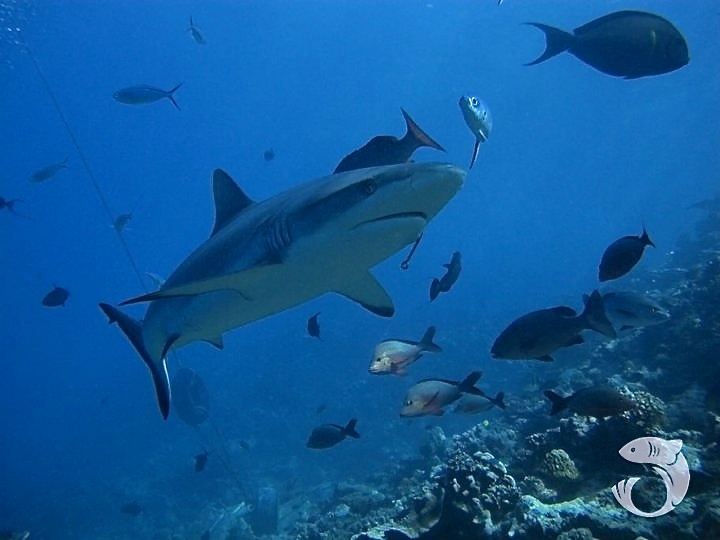 I didn’t have my first interaction with a shark until 15 years later in the clearwaters of Fiji, surrounded by bull sharks, a known aggressive species. I was enraptured by them, the way they moved through the water, the way their bodies were built to make them the perfect ocean predator. Even their eyes, which many consider lifeless and doll-like, shone with life and depth. And more than that, they weren’t trying to eat me. Over my short lifetime my fear had turned to curiosity, curiosity to understanding, understanding to fascination, and finally fascination to a passion. I moved to Guam expecting an island that reveres and loves sharks. I was surprised to find that they are mostly considered nuisances to fisherman, and for the average citizen, they remain a scary image of what could be lying beneath the water’s surface. So how do we change this perception? How do we convince people that sharks are not to be feared, and even more relevant, that they are important to our lives? I’m still figuring out the answer. In the meantime, the best I can do is educate. I believe that fear largely comes from misunderstanding, in this case a misunderstanding of what sharks are and why they exist. Many people do not realize their importance, and that without them Guam (and the world) would be a much different place. A place without enough fish to eat, a place where the once-thriving ocean starts to empty. For Guam, we need sharks for an infinite number of reasons, and until people really understand those reasons, we will continue to live in fear of these demonized animals. There is much hope, however. As people begin to see the effects humans are having on our planet, more and more communities are expressing interest in environmental education; in learning how we are all connected. This growing passion is what will lead to change, and I truly believe that Guam holds much potential for becoming an island that does love sharks, and that loves them enough to revere, not fear them. Micronesian Conservation Coalition aims to start this wave of change. I’m happy to be a part of the beginning of this shark project. There is much to learn, much to be done and so many people to inspire. I hope that as we start to build up this project, more and more members of our island community will join us in our efforts.